Noise Limits are a key part of life within all motorsport activities these days. Circuit neighbours want a quiet life yet drivers want to enjoy the sound of a clean revving engine and as organisers we see both sides of the coin. The only way for both parties to enjoy what they both want is by sensible compromise and to set limits, we see adherance to these limits as being the main weapon in the fight to maintain use of venues. Put simply we put the ability to be able to enjoy driving above the right to make noise. Fortunately testing methods are now pretty much standardised throughout the UK. The standard test being the Half Metre Static Test. It is very important that you understand which testing method is being used and what the maximum allowed limit is. The different testing methods are listed below. 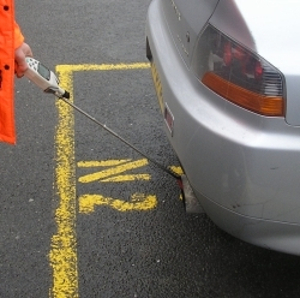 The meter is placed at 0.5metres away from each exhaust outlet at a 45 degrees angle both horiizontally and vertically. The driver will be asked to rev the vehicle to 3/4s of it maximum engine revs and the reading will then be taken. In exceptional cirumstance some venue operators (not all) may increase this distance to 1 metre. This version of the test is usually only used if it is suspected that mechanical noise is giving a false reading. Rear engined car for example. This is the one that invaribly differs between venues. Whilst cars are on track a reading may be taken literally at the trackside, the venue boundary or at a set distance. Again make sure you understand the method being used and that your car is below the limit. Some venues such as Donington Park will operate entirely on a driveby. At Javelin Trackdays we offer a free testing service at almost all of our events, most circuits will do the same for you too. We get frustrated by drivers who spend thousands of pounds on engine mods and very little on silencing. They then moan at venue operators and us because we will not let them run when they fail a noise test. What is the point in building a car that cannot be used on track?. We sometimes get phone calls from clients saying they know that they know their car is too loud can the rules be bent in any way. The answer is always “no, get your silencing sorted". Bike engines, cars with catalytic converters removed and heavily modified turbo cars especially can have problems with noise tests. When denied track access the owners usually argue that there is nothing that can be done which is not correct because we have many customers who have successfully silenced such cars. Bike engined cars for example just need bigger cans (7.5 inch min diameter usually). At most circuits it is the circuit themselves who regulate the noise of the events as they usually have to report to the local council. This means that Javelin Trackdays cannot intervene on your behalf and any decisions to deny access to a noisy vehicle are out of our control so please ensure that you take note and your vehicle complies before booking onto the trackday.